The new Rules of Golf starting the first of January disallow the use of anchored putting strokes which pretty much signs the eviction notice of long putters from golf bags. Those are ones of extra length shaft designed to be held against the stomach or chest of the user while making a stroke, thus the sobriquet bellies and broomsticks. This is not the first time the USGA has made a fundamental change to what is allowed in the way of equipment or to the way the ball is hit. Examples coming to mind are the 2010 Rule diminishing the size of grooves on the more lofted irons and placing restrictions on the allowable cross section—the so called “box groove” ban. Or the dictum placing an upper limit on the trampoline effect or springiness of club faces? Or playing a speed limit on the golf ball, a restriction that has a disproportionate impact on average golfers compared to tour professionals. In fact, all of these examples have had similar effect of making it more difficult for the average player…professionals have the talent and time to compensate. 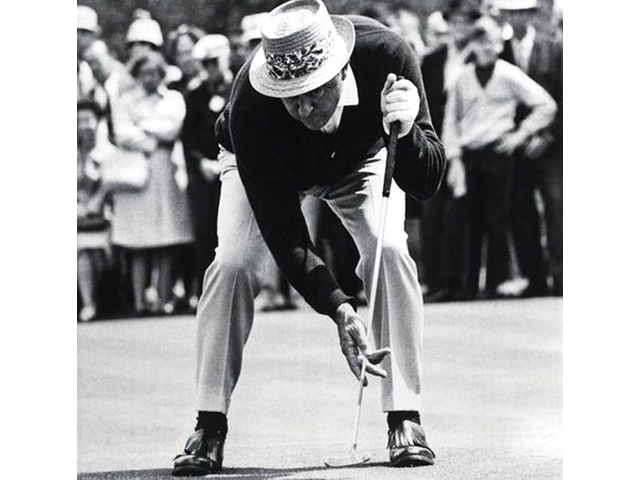 However, this isn’t a rant about perceived inequity in Rules of Golf modifications but about one of the true greats of the game, Sam Snead. 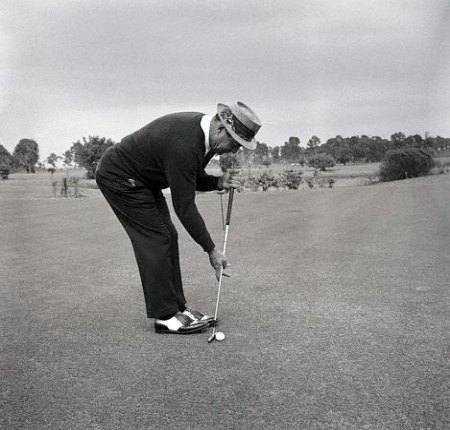 The story goes during the 1966 PGA Championship Snead, who at 54-years old, though still a prodigious ball striker was having trouble making anything resembling a smooth putting stroke and in fact had the “yips.” After a double hit on short putt he switched to grasping his putter near the end of the grip with his left hand, well below the grip with his right and straddling the line as though playing croquet. The stroke looked strange and even awkward but worked with Slammin’ Sam going on to a T-6. More than a little impetus for the change may have come from another golfing great Bobby Jones who, observing Snead astride his putts at the 1967 Masters, was not pleased. Snead acknowledged it was the USGA’s prerogative to change the Rules and rose to the occasion by placing to the left side of the ball facing the hole and continued with the, albeit modified, croquet-style stroke. He called it putting side-saddle. The question of course is how did it work and the answer is very well. Not only did Snead win the PGA Seniors three more times but at age 62 managed at third place tie at the 1974 PGA Championship.